The square knot can join 2 ropes of the same size. It is the first knot we learn to make with our shoelaces. It looks like a bow and is hugely unreliable. Its breaking strength is only 45% of the line strength. This leads surgeons to add an extra turn to the first half knot. 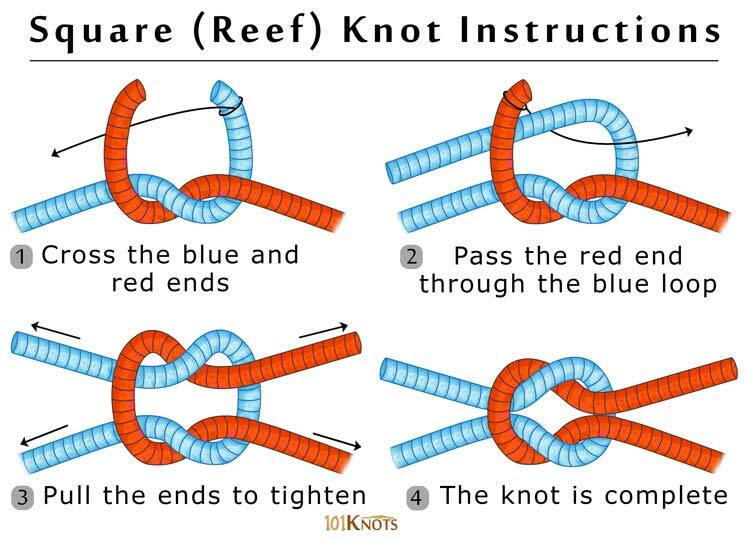 The simple and ancient binding knot is also known by the names Hercules, Herakles, flat, and reef knots. It helps to secure a line or rope around an object. It creates unique designs of jewelry. It dates back to 1794 and was commonly used in reefing and furling sails, earning it its name. The name square knot, on the other hand, has been around since 1841 according to contemporary maritime books. After the knot is made, the tag ends should lie on the same side of the knot. If they don’t, you might just have made the thief knot, a highly inferior version. A half hitch can be added at each end of the knot to dress and secure it. Since the friction of the 2 rope ends holds it together, it is not suited for nylon ropes. Half square knot- Popular in macramé, it utilizes only the first step of the diagram. Double square knot- In macramé, you have to work with 8 strands of rope instead of 4. Easy and quick to tie It slips and comes undone. Hence should not be used as a bend. Elegant Only suited for light duty. Unsafe for tying or binding heavy loads and life-saving. Sheet bend– A more secure alternative. Can be used with lines of unequal diameters. Slip knot– Forms a loop and a stronger knot. Surgeon’s knot– The modified version adds an extra twist to the first throw forming a double overhand knot. 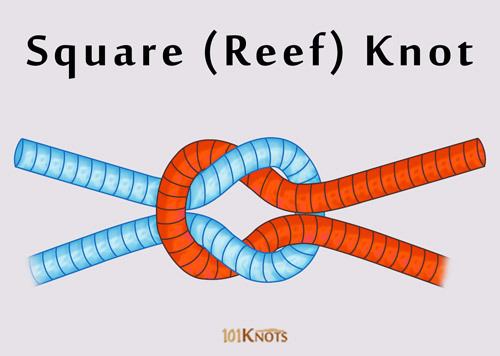 Fisherman’s knot– A proper bend that is strong. Making friendship or other bracelets and necklaces of hemp, paracord, elastic or any other cord, embroidery floss, even leather. It can be used for adjustable closures and clasps in bracelets. In macramé patterns (some use an alternating square knot and square knot button pattern) for necklaces, chains, bracelets, sinnets, plant hangers. As a religious symbol on the award patch of the BSA adult Boy Scout uniforms. The Arrow of Light, the highest Cub Scouting award also bears this emblem. It is also used by girl scouts and in scout games. Tying neckerchiefs and neckerchief slides in navy uniforms, karate belts, baseball gloves, triangular bandages, webbing, handkerchiefs, bandanas. As a substitute for cargo straps. Making bows (ribbons are good for these) on dresses, etc. In surgical sutures, beadwork, electrical wire splice, logos and hair braids. Making no-sew fleece blankets, napkin rings, headbands. Securing things to a horse’s saddle. In rappel seats, they are tied with overhand safeties. You can remember the tying process by the phrase, “right over left and left over right”.